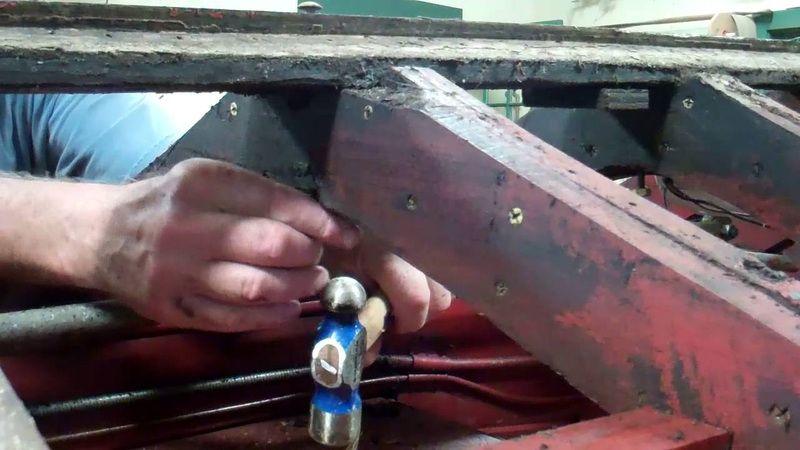 Fifteen bilge frames with one ¼” x 6” brass carriage bolt securing the keel to each frame, plus four buried ¼” x4” brass carriage bolts securing the overlap joint between the gripe to the stem! Every one we removed is original. Nary a stainless bolt was to be found. And you know just how easily those bolts “jumped” out of those ancient holes! Well, somehow the two I selected for this video did jump right out. There is nothing like a heavy ballpeen hammer and a drift to persuade the others to leave positions they have held since 1946. Unlike the degraded stainless fasteners, which are from the early 1980s, all of the brass bolts appeared perfect. However, when placed in a vise and tapped slightly, they simply flopped over like wet noodles. Into the recycling bins they go. But we have the keel out where we can clean it properly and begin working replacing the hogged final 12 inches or so. However, in the process of separating the gripe from the keel, which forced us to take a hard look at the gripe, we concluded that it cannot be saved, as is waiting for you in the clip that follows this one.